Since 2013, the work of all the partner structures in the Henri-Fabre project has already referenced more than 500 training activities in the territory, identified the needs of manufacturers in major sectors, and launched a series of actions: adaptation of the training mechanism, development of tools to enhance the attractiveness of training with an image deficit, construction of modules on new skills. The PERF Henri-Fabre HR Training Jobs Platform project forms part of this dynamic with all the players involved in the Employment/Training component. A series of actions taken by public and private players has been defined to address the constantly changing industrial needs: needs anticipation (shared monitoring), GPEC [forward management of employment and skills] system defined by all players linked with companies (DIRECCTE, Pôle Emploi, CCI, competitiveness poles), training engineering plant, detection and personalization of skills profiles of job seekers, training labelling, etc. In August 2017, TEAM Henri-Fabre was awarded an Invest in the Future Program (PIA) by the Caisse des Dépôts et Consignations. Through a combined effort and surrounded by its partners (ENSAM, CFAI Istres, CIPEN, Académie Aix Marseille Provence) and also funded by the Provence-Alpes-Côte d’Azur Region, three actions will be taken over the next five years to address the issues of the industry of the future and meet the need of our region. Invest in new technical support centers to provide training for the trades of the future identified in the first phase. Design and deliver training on and through digitized tools providing easy access, fast implementation, personalized learning, a modular structure adapted to initial and vocational training. Integrate into training the pedagogy of collaborative projects, made possible by networking of technical support centers (multiple audiences, inter-level and intersectoral). 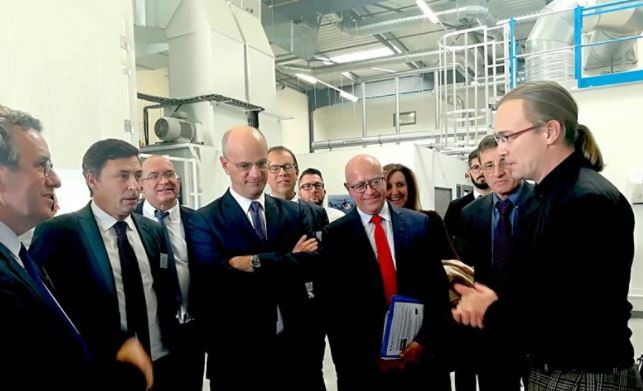 The region’s first Trades and Qualification Campus (CMQ) to guide development of the Henri-Fabre project’s Employment-Training component opened in late 2013, initially focusing on aeronautics. On January 1, 2017, to meet the project’s needs, the Campus expanded its scope and is now known as the Henri-Fabre Trades and Qualification Campus for the Industry of the Future. This campus is an ecosystem that brings together, in an extramural network, institutions of secondary and higher education, initial and continuing education, with school or apprentice status (6 Lycées, 2 Apprentice Training Centers, 2 Universities and 5 Engineering Schools). It strives to bring together training players to provide solutions adapted and responsive to current and future skills requirements of the business world.